It's hardly surprising that 'third kits' are not a big feature of the GAA. 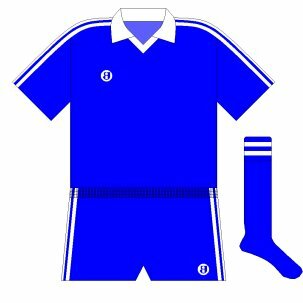 Colour-clashes are not a hugely regular occurrence, often when there is a clash neither side changes kit and, in any case, one change shirt should be enough to alleviate any confusion that may arise. 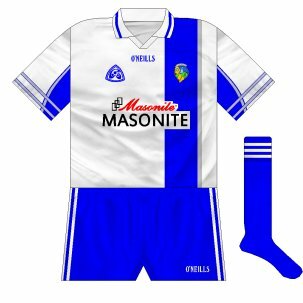 There have been a few occasions, however, when counties have worn three different jerseys in the same championship year - in fact, different jerseys in three consecutive years. Here are the examples we are aware of, if there are any others please do not hesitate to get in touch by emailing admin@prideinthejersey.com. The most recent occurrence of this phenomenon came in 2012. 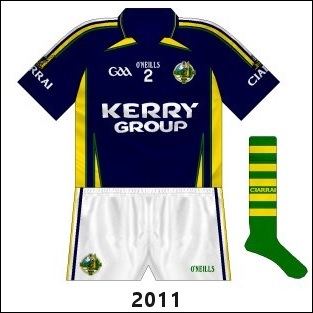 Having won the Munster championship in their tradiitonal green and gold, Kerry met Limerick in the All-Ireland quarter-final and wore the navy shirts that had been used against Donegal and Meath in 2009. A change was again required for the semi-final against Mayo, but following complaints from players regarding the visibility of the navy jerseys, a new version, in the same design but in royal blue was used. In 2007, Leitrim had cause to wear three different kits. 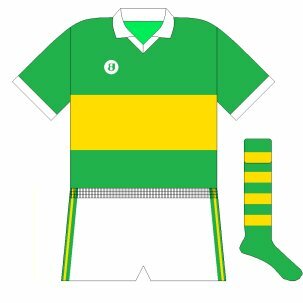 Having been drawn against London in the Connacht quarter-final, they utilised their regular change kit of gold with green trim, often a reversal of the 'home' jersey though in this case it had the same collar and sleeves with a plain body. 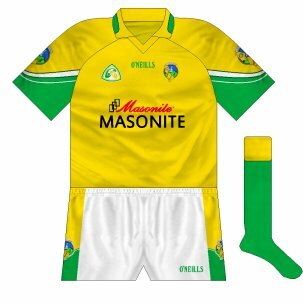 The normal shirt was back for the semi-final loss to Galway, meaning that Leitrim entered the qualifers, where they were drawn against Donegal, who had gold jerseys with a lot of green trim. 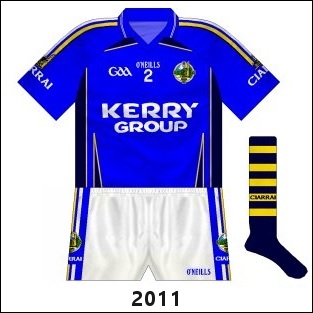 Both sides wearing change kits would not have done anything to sort the clash so the GAA ordered the counties to line out in provincial colours. 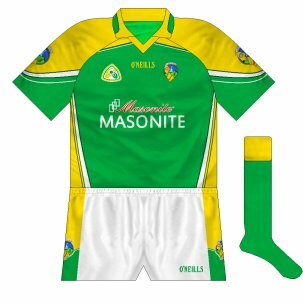 Donegal wore saffron and black, though with their regular green shorts and socks, while Leitrim were in Connacht's white and blue. Coincidentally, Donegal were the last county before Leitrim to wear three different kits, in 1992, the year of their first All-Ireland success. In that year's Ulster semi-final against Fermanagh, Donegal wore an Ulster-style kit of amber and black while the Ernesmen wore a reversal of their green with white trim. What was then Donegal's regular strip of green with a gold hoop returned for the Ulster final win over Derry, but an All-Ireland semi-final meeting with Mayo necessitated another change. 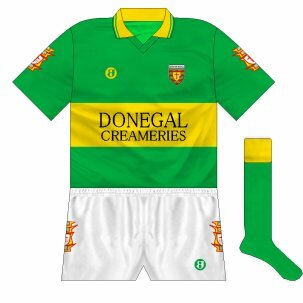 Having lost to Meath in the Ulster colours in 1990, this time they opted for a bespoke change kit of gold with green sleeves and green shorts. 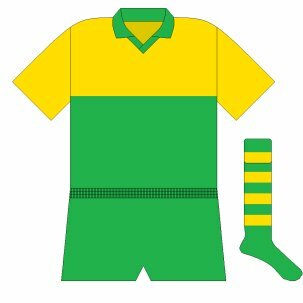 Having beaten the westerners, this kit was retained for the All-Ireland final win over Dublin (though gold socks with green tops were added), and it still forms the basis for Donegal kits to this day. Perhaps unsurprisingly, though, Kerry were the first. In 1981, the Kingdom overcame Cork while wearing the traditional green and gold, setting up an All-Ireland semi-final against Mayo. Provincial colours were the order of the day for that clash, meaning Kerry in all-blue, as they had been the previous year at the same stage against Offaly. After beating Mayo, it was Offaly who were the opponents in the decider, but this time it was decided to allow the counties wear their colours in configurations different to normal. 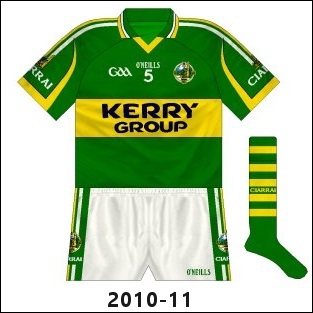 While Offaly wore a white jersey with green and gold shoulder bands, Kerry came up with this unique outfit, almost half-and-half green and gold, with green shorts. The new kit didn't seem to bother them, however, as they made it four All-Irelands in a row.